I first drafted this post a couple years ago, when I was in the process of renovating my kitchen in my new york city apartment. The kitchen renovation was a lot of stress and difficulty so I had written this post and saved it as a draft. I realized I never published it, but figured why not? By this point, I’ve had my washer and dryer in my kitchen for about 2-3 years so I thought it could also be helpful to share how the appliances have been holding up. Woohoo! I finally finished installing a washer dryer in my apartment – which in New York City, let me tell you, is an almost impossible feat. While the rest of the country would probably sneer at a washer dryer in the kitchen, ask almost any New Yorker and they’d take a washer dryer combo anywhere – even if it came at the cost of a dine-in kitchen. Ha! 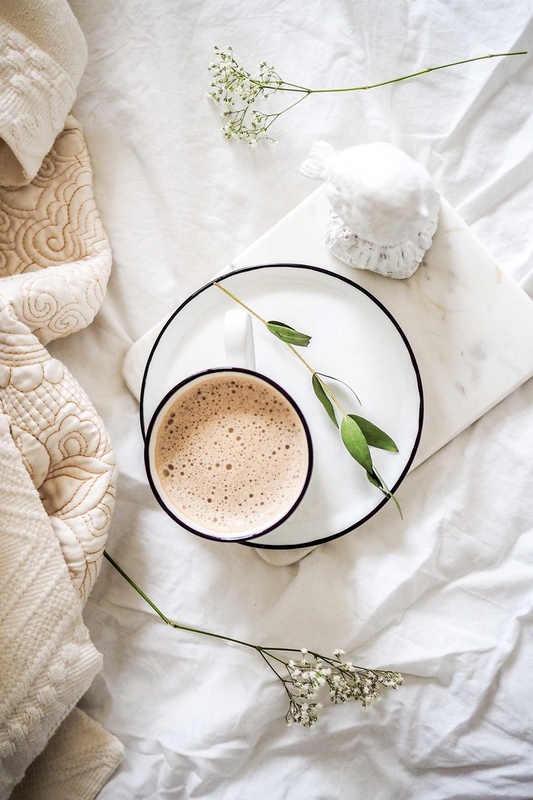 If you’re looking to do the same, especially if you live in a small apartment, I thought I would share some tips that I learned throughout the renovation process. Why Are Washer and Dryers so Difficult to Find in NYC Apartments? If you live in a co-op building or rental apartment, chances are you don’t have a washer dryer. If you’re lucky, the building basement has a laundry room. I found out that New York City apartments rarely have washer dryer combos due to concerns about old piping, exclusive commercial laundry contracts, and extensive maintenance issues. They’re typically outlawed even if you buy your apartment – crazy right? If you really want one in a rental, look for new construction luxury apartment rental buildings. If you want one in a purchased apartment, stick to condos. I luckily live in an apartment building that does allow washer dryer installations so for me, it was a dream to install one and I knew I wanted to include them when we renovated our kitchen. 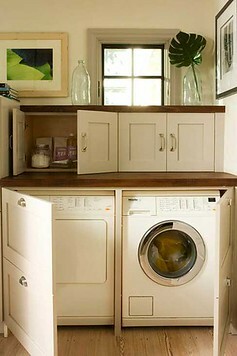 Here’s how to do it along with tips on how to hide the washer and dryer so they don’t look unsightly! The first thing to do is choose your appliances, so you can set your budget and also have the appliance dimensions so you can plan your kitchen layout. 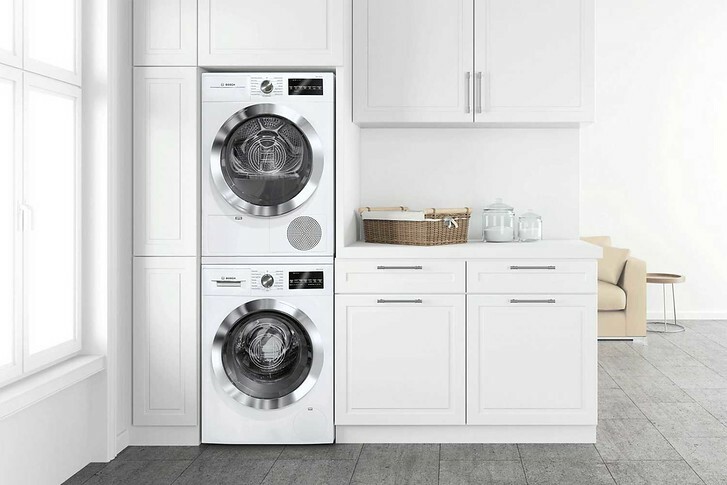 There are limited compact washers available – most of the models are from the European manufacturers Bosch, Asko and Miele. I compared all the compact washer dryer brands and models in-depth in this post – outlining all their product dimensions, reviews and which we ultimately went with. It really just comes down to price and size as most front loading washers are very similar. On the other hand, there are a couple options on the market when it comes to front loading dryers that will impact your kitchen / laundry configuration. If you have the ability to vent to the outside (this will be impossible in 99% of NYC co-op apartments) then you can look into a gas dryer (also called a vented dryer) compared to an electric condensation dryer. New construction and condos can be more flexible about ventilation. Another thing to consider with space constraints is locating the washer and dryer separately. I initially had planned for each to be on opposite walls of the kitchen, facing each other. Knowing nothing about the mechanics for installing a washer and dryer, I thought the dryer could go against regular drywall, as it didn’t need a water line like a washer. What I found out was that a dryer removes excess water from your clothes and then needs to dump that water somewhere. If you’re going with a gas dryer model, it will vent directly outside. If you’re limited to electric dryer, there are more limitations. 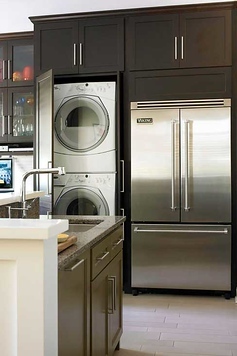 Most electric condensation dryers need to connect to a plumbing line or washer to dispose of the water. There are some models that have a little storage container where the water accumulates and which you can pull out by hand to dump out the water. Asko calls this their “heat pump” dryer (model T884XLHP) but you’ll pay a hefty premium for this, approx. $2800, just for a dryer that you have to manually empty. Maybe I’m missing the appeal? Needless to say, I didn’t buy that one and instead adjusted my layout to place the washer dryer side by side. There is probably a greater selection of heat pump dryer models on the market if you have the space to go for a full size dryer model. I placed my washer dryer in my kitchen. I know most Americans think that this is unsanitary but when you live in a small NYC apartment your options are quite limited. Lots of kitchens in Europe have a washer so I figured if the Euros can do it, I can do it! 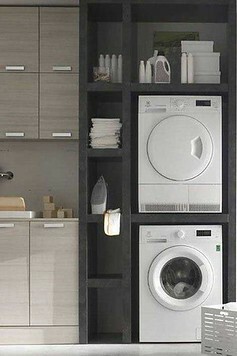 Ideally, you might have extra space off your bathroom or a bathroom closet that you can turn into a laundry closet. If you’re buying your neighbor’s apartment, NYC law requires you to remove the second kitchen, so most people will opt to convert part of the kitchen’s electrical, gas and water lines into a laundry room. When you design your kitchen layout, you can either install your washer dryer combo side by side or stack them on top of each other. Almost all the brands allow you to do either, but if you choose to stack them, you sometimes need to buy a stacking kit. The way my small NYC kitchen is laid out, it made more sense to have them side by side under the kitchen counter. My side-by-side washer and dryer are located under the counter in my kitchen. I wanted both appliances to be completely hidden, which necessitated semi-custom cabinetry. It’s much easier if you’re happy to have the appliances in view. Once you’ve narrowed down your appliance choices, download the spec sheets and installation manuals for each washer and dryer model you are considering. You’ll need these when you design your kitchen layout so you can plan your kitchen cabinet measurements accordingly. The appliance installation manuals are available directly on the manufacturer website, but also typically each online appliance store will post the links as well – which is so handy! AJ Madison is a really popular online website for New Yorkers to buy appliances and they have a showroom in Brooklyn if you want to check inventory in person. I thought that because the washer and dryer were each 24″ inches wide that I would need 48″ of horizontal space, with maybe 1″ or 2″ extra inches for the doors. My expert kitchen designer helpfully pointed out that if you want doors to enclose the appliances, you’ll need extra clearance on the sides for the doors to hinge to. 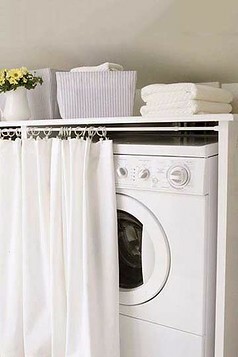 If you’re tight on space, you can consider leaving the appliances exposed or installing a curtain. I really wanted enclosed appliances so that the washer dryer were completely hidden behind kitchen cabinets. I would panel everything including the stove if I could (I don’t like the look of appliances) and I worried the machines could be a magnet for crumbs, spills, etc. My apartment entrance faces the kitchen so I wanted as minimalist a look as possible. Finally, my NYC kitchen is laid out in a narrow galley style layout so I decided that a pure row of cabinetry would help make the space feel larger. 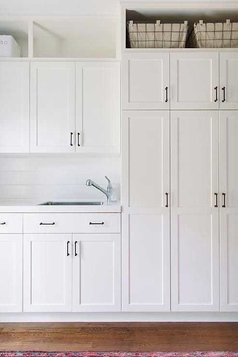 The amount of extra space you will need in your kitchen cabinets depends on the door configuration you choose. I found during the kitchen design process that pocket doors require the most amount of extra space since you need space for the hinges to attach to, plus space for where the pocket doors will slide in. I went with the regular cabinet door option to save on space. The other design consideration is the layout of open doors. 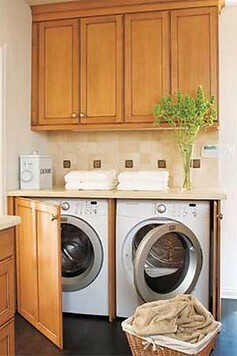 Most front loading washing machines need to have the cabinet doors open for ventilation while the machine is in use. Make sure there’s clearance for your cabinet doors to open at a full 90 degree angle. This will also impact space. 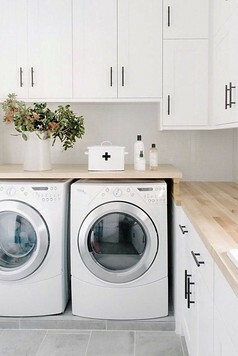 It’s also recommended to keep your washer door open after the wash cycle to wipe down the doors and let the machine air out to avoid mildew and mold from building up. 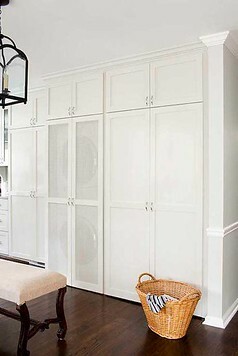 I saw some kitchen photos where the cabinet doors were ventilated, which looks like a nice idea! This is optional, but I wanted the washer and dryer to fit inside regular base kitchen cabinets with the counter on top – so that when all the doors were closed, the kitchen would look perfectly ‘normal’. If you purchase the 24″ washer and dryer models (I believe this is the smallest option on the market), the appliance height will be 33 1/4″ so they can fit under a standard 34″ cabinet! 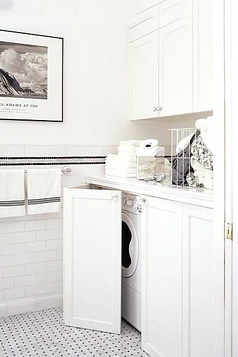 A full size washer that’s 27″ wide will be too tall to fit inside a regular kitchen cabinet. I’ve seen pictures where people have beautifully designed a raised up counter portion to accommodate a full size appliance. It’s up to you. At the time we were designing the kitchen, I was very concerned about the aesthetics so I ruled out a 27″ washer. Not only are they wider than my tight small kitchen’s length, they’re also taller and deeper. Now that I’ve used the 24″ front loading washing machine for a couple years, I will say that the interior is quite small. It can handle about 1 – 2 weeks worth of laundry for one person. If you’re really sweaty and change your clothes frequently or you live with a big family or have young children, you might be really frustrated by the limited size of a 24″ washer. The other downside I should mention is the spin power. 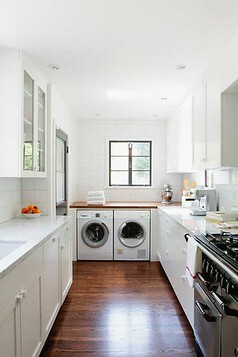 I always set the spin cycle to “low” because I get nervous about the washer spinning under all that wood and marble. I’m always afraid one day it will be like a bull let loose in a china shop and just smash the entire kitchen to pieces. So, if you use a low spin cycle, you might need to run an extra 10 minutes of spin to get the water out of your clothes. There’s a lot of babying just to have an in apartment washing machine! Even though the appliances can sit flush side by side, my kitchen designer recommended placing a 3″ filler piece in between the two cabinets to provide support to the counter top. She especially recommended this since I went with marble countertops and stone can be quite heavy. Also check the depth specs of your appliances. The washer and dryer need some extra side and back clearance for ventilation as well as room for the hose and piping in the back. To make sure the appliances would be sticking out farther than the cabinet boxes, we left some space in the back and pulled out the cabinets a couple inches forward so everything would align flush. Because of this, we needed extra material for the counter top to cover the gap. I went with the same marble for both the backsplash and counter and had the countertop edges finished with a 2″ thick square eased edge. A couple other things to figure out during the design phase are the water lines, electrical outlet placement and voltage considerations. The specific washer and dryer models I chose had the washer actually plugging into the dryer. My contractor was worried the electrical usage would be too significant for the apartment to handle so if you also live in New York City or a city with space and electrical constraints, you’ll want to verify that your electric dryer is within code for your apartment’s amperage. In New York City, most pre-war coops have a set limit on the amount of electricity flowing into each apartment. A 2 bedroom apartment typically has more amperage capacity than 1 bedroom apartment and so on and so forth. 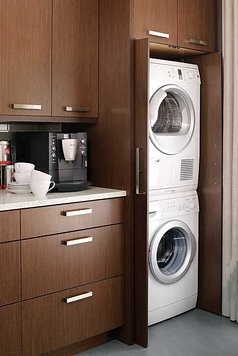 If you have a 1 bedroom apartment or large studio, you can still fit a washer and dryer with only 30 amps of power. 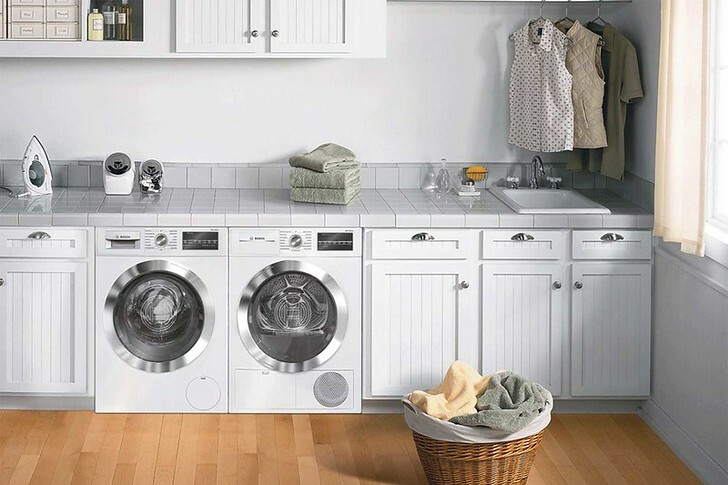 Most compact washers use about 11-13 amps and most compact electric dryers use about 13 – 15 amps. Typically you won’t be running them both at the same time so there won’t be an issue. Amperage is the amount of electricity drawn when the appliance is in use. It’s different from the power cord amperage (which is typically 30 amps). My contractor got confused and initially told me the dryer would blow a fuse in the apartment because he looked at the wrong metric so make sure you’re reading the specs carefully. Note: Throughout my renovation experience, I found that my contractor was (surprisingly) not the be all end all and if you really want something done, it pays to put in the time and attention to research on your own and double check everything. It’s pretty difficult to increase your individual apartment’s electrical system as it’s set by the building and would involve re-wiring up from the basement to your apartment floor. It’s also really, really expensive so I didn’t even consider that route. Finally, you’ll want to check how many electrical outlets you’ll need and discuss that with the contractor or electrician. Some washers plug into the dryers so you may only need 1 outlet. At the time of my renovation, the only compact washers available in the US were made by European manufacturers – these machines utilize 220 voltage. If you’re in the US, check that you either have 220V or that your electrician can make the change. Flooding is always a concern with washer dryers. Living in a coop apartment building with plenty of neighbors, I was extra cautious about any flood issues and potential liabilities. It’s highly recommended to place the hot and cold water shut off valves in an area that is easy to access so you can shut off the water valves whenever the machine is not in use. I don’t know anyone that actually shuts them off between use.. but it’s recommended! The shut off valves are located behind the appliances and need to be placed at a certain height on the wall. Since the washer dryer was to be in my kitchen I opted to hide the valves in the sink base cabinet. My sink base is really crowded, but it makes everything easy to access and out of sight! There was no way I was placing it in my backsplash after splurging for marble. For a month or so after we moved in, my sink had some leaking issues so there are always some small issues with a renovation. If I leave for a trip or an extended vacation, I try to always remember to shut the valves off… just in case. When the washer is shipped, the manufacturer bolts the drum to the machine to prevent it from moving in transport. Make sure to remove these before you install them in your apartment. If you run a load of clothes with the transport bolts still in place, your machine will literally hop like a jackrabbit out of the cabinet box. Destroying your cabinets in the process. I’m not sure if this is only a Bosch machine issue? But, I think it’s a pretty common problem that people forget to take out the transit bolts so just make sure to confirm with your contractors that they’ll remove the bolts. Each machine is really heavy so even though I discovered the problem, I wasn’t able to take out the washer from the cabinet by myself (it’s really wedged in there) or flip them over to remove the bolts from the back (the washer is heavy!). In the end, I asked my contractors to come back but they didn’t understand. Anyone who has done a renovation knows that sometimes it can be difficult to have any help after a job is complete. They recommended installing vibration pads because they thought I was complaining about regular shake and noise. I had an extremely stressful renovation process so hopefully this helps someone in the future. Please do consult a licensed contractor or expert for your own remodel, as I’m no where near an expert! 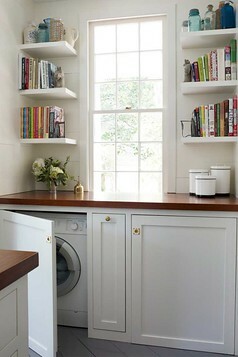 I am doing something similar and I don’t want the washer hookup to show. You said the water supply is under the sink but where is the drain? That seems to be the big issue as it has to be a certain height that is often higher than the countertop? It also drains under the sink cabinet. We built the kitchen custom to accommodate for all the extra plumbing.